Numerous tests and scans confirmed pregnancy, but eventually the doctors concluded something was really wrong. I had a Molar Pregnancy - a very rare gynaecological abnormality where instead of growing a baby, the cells grow into a tumour. My life was turned upside down. One minute I was a fit, active and healthy woman, the next minute I had a tumour in my uterus. It was truly terrifying to be told that I would need chemotherapy, but reassured that since the tumour was caught early it was very treatable. I felt hopeful when the doctors said that low grade chemotherapy would work. Though I had the typical tiredness and nausea, I tolerated two months of chemo pretty well. We started to make plans for a holiday - we felt we deserved it after all of this! But then my oncologist told us the tumour was more invasive than first diagnosed, that it had developed into a cancerous tumour and cancer cells had spread outside of my uterus. I was swapped to stronger multi-agent chemotherapy bringing increased side effects, one being hair loss. The enormity of what was happening began to sink in. This was serious, potentially life threatening. I was very sick. Two months turned into six months of chemotherapy, which was tough. I truly don’t think I’ve ever felt lower in my life than when I was lying alone at night in hospital listening to the chemo pump and the monitors beeping away. No hair, 12 kgs heavier from not moving for months, and feeling awful from all the drugs being pumped into me, I missed my kids, I missed my old life, and I kept thinking - what had I done to deserve this? Life is truly cruel sometimes and this was my big test, my test to see how strong I could be to get through, to get healthy again for myself and my family. Charlie’s 3rd birthday and the day of my last chemo dose. The chemotherapy had finally worked and I could start to get my life back!! But I found that once you finish chemo it’s not the end of the journey. My body was so weak, and I had a long way to go to build back my strength. I truly wouldn’t wish chemotherapy on my worst enemy; it was a horrific ordeal and one that has changed my life forever. I also know that it made me a much stronger person. I learned I am a fighter, a survivor, and without doubt a STRONG WOMAN. 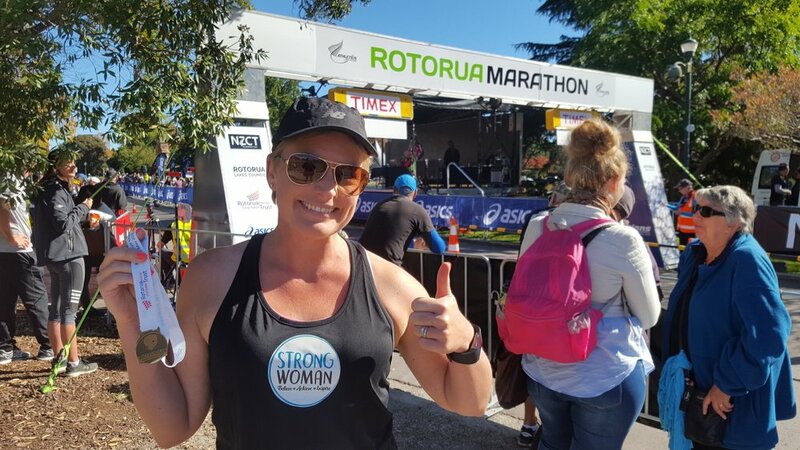 So in May 2017 I ran the Rotorua Half-Marathon, and I decided to run it for charity. Everyone was so generous and supportive and my ‘Give a Little Page’ raised $2600 for the Gynaecological Cancer Foundation of New Zealand. The 21 kms were incredibly tough and I was so proud of what I had achieved - I had smashed one of my goals. I then decided that if I could turn around being unfit, overweight, and near rock bottom, I could help other women get fit and healthy too. I wanted something good to come from all of this, and decided to inspire others to believe in themselves too - to believe that they are a Strong Woman. Life likes to throw curve balls but the key is how we deal with these situations, our attitudes, our determination to fight, and the inner voice inside us that says “You can do this, you’ll be ok, you are strong”. The word that I felt related to my whole journey the most was STRONG. So Strong Woman was born….